Kerala Parotta or Malabar parotta is a unique parotta dish from Malayali cuisine. It is a layered paratha or flaky paratha made with refined flour. Kerala parotta is a common street food in southern India. It is served with vegetable kurma or coconut stew. Read more about Kerala parotta here. Kerala Parotta is similar to north Indian laccha paratha in the way of rolling and making layers. The only difference comes in making a dough. Laccha paratha is prepared with whole wheat flour and Kerala parotta is prepared with refined flour. An egg is also a part of this parotta which makes it soft. Important- Making Malabar parotta or Kerala parotta is very time-consuming. After kneading, the dough should be kept undisturbed for an hour. This helps in creating gluten and parotta will be more stretchy. After making spiral dough balls, again keep them for at least 30 minutes. These are the tricks to make this parotta very flaky and layers will be more visible. I finished everything in 45 minutes :). 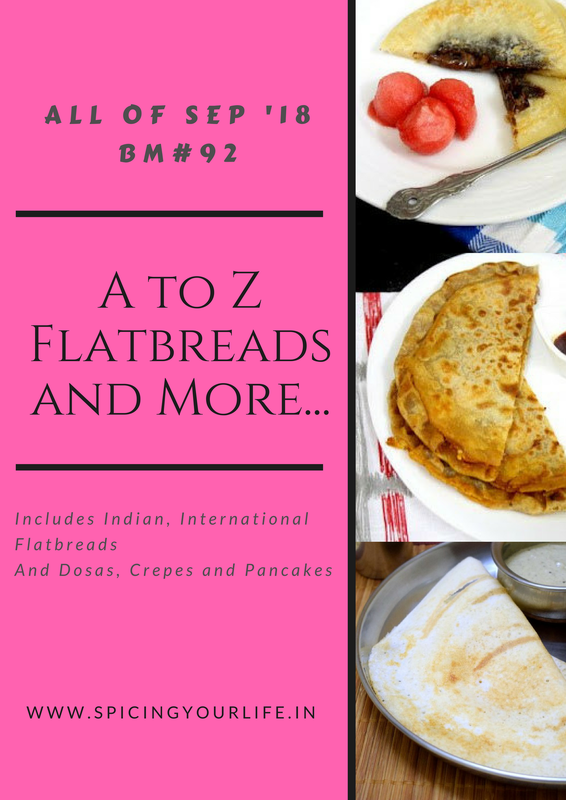 Check more paratha recipes under “Indian Flatbread” category. To make this paratha first knead a soft dough. I used 1:1 quantity of whole wheat flour and refined flour. But this parotta is made with refined flour itself. Rest the dough in every step and then make this parotta. So let see how to make Kerala parotta or Malabar parotta. First of all, combine all ingredients in a mixing bowl and knead a soft dough. Apply some oil on the top of the dough and rest it for at least 30 minutes or one hour. Divide the dough into equal portions. I made 4 parotta with this quantity. Grease the surface with oil and start rolling one portion. Stretch it as much as possible. Apply oil all over it once again. Make cuts with the sharp knife as shown in the pic. Start collecting from one side of rolled dough. As you come to another end and get a log, stretch it a bit which will make it longer. Start twisting the log and gently roll it into a spiral. Press the last edge into the center. After 30 minutes take one spiral dough ball, apply some oil and roll it up to 5-6″ circle. Heat a griddle on medium heat and place the rolled parotta. After a few seconds flip it to another side. Press on the side gently to make layers visible. Repeat the same process for the rest of the spiral dough ball. Kerala parotta or flaky parotta is ready to serve with any curry. Serve immediately. Making these paratha needs a lot of time. Resting time is very important otherwise flakes does not come out nicely. I finished the whole process within 45 minutes due to time shortage but was happy with the outcome. This parotta should be served hot and immediately. They become very chewy if kept for longer. Kerala Parotta or Malabar parotta is a unique parotta dish from Malayali cuisine. It is a layered paratha or flaky paratha made with refined flour. Kerala parotta is a common street food in southern India. It is served with vegetable kurma or coconut stew. hi!,I love your writing so a lot! share we keep in touch more about your article on AOL? I need a specialist in this area to resolve my problem. May be that is you! Looking ahead to look you. The parottas have surely turned out great..my kids love the flaky layers..good pick for the letter! Thanks for liking malabar parotta. This one is my kids favorite and a very famous one around here. Even the smallest eatery will feature this parotta. You have made it perfectly! Thanks PJ, I made it the first time. But yes loved the result. LLove this kerala or malabari parotha.. so flaky and tasty. Thanks Priti, even we loved it. The layers have come out so distinct Bhawana! I love that you used both APF and whole wheat flour for the dough. The detailed pictorials are very helpful when making it for the first time. Thanks Sandhya for liking this Kerala Parotta. I too tried first time. Shhh Bhawana lets not show this post to my hubby dear or he’ll eat my head to make his favorite Kerala Parottas. And of course he will question me that why I didn’t make them for the letter K. Love how flaky they have turned out and love that you’ve used both plain and wheat flour. hahahha so sweet Mayuri di. Thanks for appreciating this Kerela Parotta recipe. Kerala or Malabar paratha is a favourite in my house and always some is kept in freezer for emergency reasons. Just love the way you have done it. Want to grab them now. Thanks Renu for liking Kerela parotta. I did not get that many layers but was happy with the outcome in short duration. Never get bored of this flaky beauties, you have got them prefectly. Though this parottas calls for long preparing process, they are just worth to try na. Well done. This parota has been on my to do list for a long time but I always postpone it because it takes so long. You have done a wonderful job making them so patiently! Such a delicious dish! Wow! It looks so flaky and the layers are visible all through. Lovely pick. This is one of our most fav street foods. Though our method of layering the dough is a bit different. You have made it so flaky and with a spicy kurma, this tastes so divine..